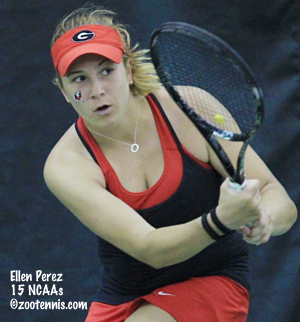 University of Georgia junior Ellen Perez won the US Open main draw wild card that Tennis Australia receives in trade with the USTA at a tournament held this weekend at the IMG Academy in Bradenton, Florida. Perez defeated Naiktha Bains 6-2, 6-2 in the first round, top seed Arina Rodionova, also by a 6-2, 6-2 score, in the semifinals, and today claimed the wild card with a 6-3, 6-4 win over Ashleigh Barty. Perez has been playing $10,000 tournaments in Europe this summer (she was a July Ace for winning one singles and three doubles titles last month), so the US Open will be a huge step up for her, but the 20-year-old has previous experience at a slam, having played the main draw in women's doubles at the Australian Open this year. Perez finished her sophomore year No. 5 in singles and No. 10 in doubles in the ITA Division I national rankings. For more on Perez, see this article from georgiadogs.com. 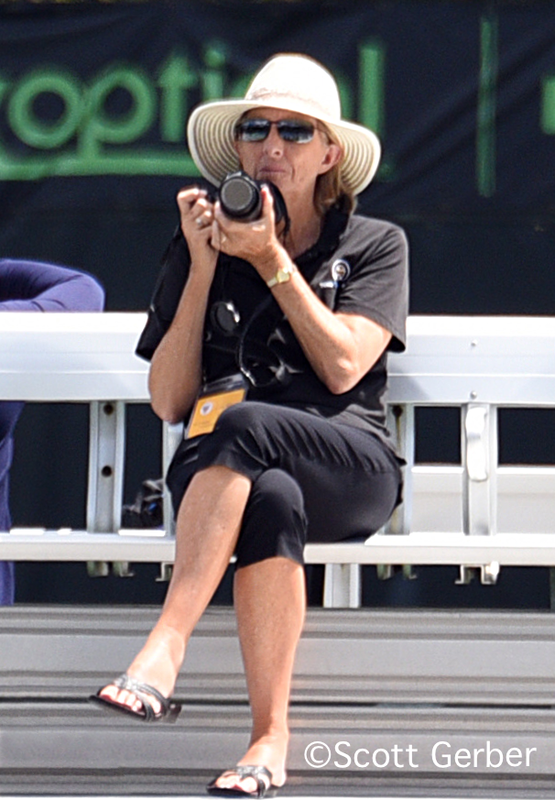 I'll begin my coverage of the ITF Grade 1 Prince Georges County International Hard Court Championships Monday, with the main draw getting underway at 9 a.m. at the Junior Tennis Champions Center and the University of Maryland Tennis Courts in College Park. Wimbledon champion Anastasia Potapova of Russia is the top seed in the tournament; last year she lost here in the first round to Amanda Anisimova, who is playing US Open qualifying this week. Potapova has another intriguing first round match this year with 14-year-old Whitney Osuigwe, who led the USA's 14-and-under team to a runner-up finish at the ITF World Junior Tennis competition in the Czech Republic earlier this month. No. 2 seed Claire Liu plays Victoria Emma in the first round. Other US girls seeds are Maria Mateas(4), Taylor Johnson(9), Caty McNally(10), Morgan Coppoc(11) and Natasha Subhash(15). 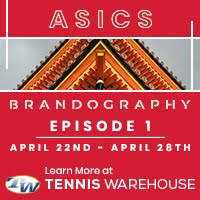 Johnson has a tough first rounder with friend and occasional doubles partner Carson Branstine, who finished third at the recent USTA 18s Nationals in San Diego. The top six seeds in the boys draw are international players, led by No. 1 seed Genaro Olivieri of Argentina. Sam Riffice(7), Gianni Ross(12), Trenty Bryde(14) and Oliver Crawford(16) are the US boys seeded. Qualifying was completed today. The boys qualifiers are Zummy Bauer, Jordan Nickerson, Jaycer Lyeons, Adam Neff, Vasyl Kiselyov(UKR), Austen Huang, Boris Kozlov and Drew Baird. The girls qualifiers are Victoria Hu, Jada Robinson, Mackenzie Clark, Abigail Forbes, Victoria Flores, Rachel Lim, Allison Bojczuk and Mccartney Kessler. For the order of play and the draws, see the tournament website. The singles finals are set at the US Open National Playoffs, with No. 1 seed Nick Meister taking on No. 4 seed Jose Statham of New Zealand. Meister defeated UCLA senior Gage Brymer 4-6, 6-3, 6-1, while Statham beat No. 2 seed Evan King 6-3, 6-2. The women's singles final will feature unseeded Sophie Chang against No. 2 seed Sanaz Marand. Chang defeated Nika Kukharchuk 7-5, 6-2 in the semifinals, while Marand eliminated Julia Elbaba 6-4, 6-4. The men's and women's doubles competitions are also underway, with draws here. Kayla Day lost her final round qualifying match to Anastasija Sevastova of Latvia 6-1, 6-7(4), 6-2 but with all the late withdrawals at the WTA Connecticut Open, she received a spot in the main draw as a lucky loser. She will play qualifier Ana Konjuh of Croatia. Nicole Gibbs and Louisa Chirico advanced through qualifying, with Chirico drawing No. 6 seed Petra Kvitova of the Czech Republic, and Gibbs playing Sevastova. The fourth American in the draw, wild card Shelby Rogers, won her opening round match today, beating Kristina Mladenovic of France 6-1, 6-1.